With the Boston marathon just completed and the Houston marathon already on some runners' minds, I wanted to share some recovery suggestions that will keep you from doing more damage to your body while training for and in the aftermath of completing a 26.2 mile race. One of the most common side effects of running a marathon is day-after foot pain, most often the result of inflammation in the soft tissue of your feet. This is frequently experienced by runners who trained on softer surfaces than the race course, or who wore down the padding in their shoes during training and didn’t bust out new shoes for race day. Train on the surface you’ll be racing on. If you are training for a marathon run on roads, a treadmill or trail path won’t prepare your feet for the impact. Run in a well-cushioned shoe. 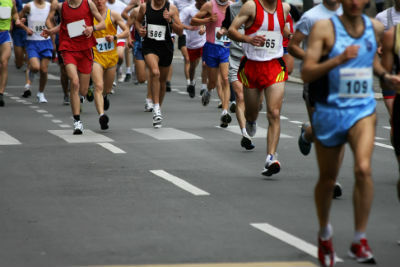 Racing flats or old, worn-out shoes will leave your feet to experience most of (if not all) the impact of the pavement. Proper training can certainly help put you on track for an injury-free race day, but the steps you take immediately after your race can also go a long way towards protecting you from pain. The first thing you should do after you cross the finish line is change out of your sweaty clothes and get into dry ones. You should also change shoes (another pair of running shoes would be best, so your feet won’t swell up and your feet will have the support they need). Once you’ve changed, it would be ideal for you to lie down and put your feet up. After pounding the pavement for hours, putting up your feet will help restore blood flow and allow you some down time for your body to recover. If you’re feeling shaky, make sure you have someone with you when you lie down. Aim to get in several similar rest periods today, for 15-25 minutes each time if at all possible. Within the first 30 minutes of your finish, get nourishment, preferably a liquid containing protein. During this initial half-hour, you’ll also want to look over your body and assess where, if anywhere, you are experiencing pain; if you think you have a blister or sprain, you’ll want to try to get it taken care of right away. If you’re feeling brave, you may even opt for a cool shower to reinvigorate yourself. Next, get a real meal in and make sure you take in lots of fluids for the rest of the week. It’s probably a good idea not to include alcohol in those fluids since your body is still in major recovery mode right now. At the end of the day, get to bed at a reasonable time, leaving lots of water beside your bed in case you wake up thirsty and sore in the middle of the night. The first day may not be your toughest—the next two will likely test your strength quite a bit. It’s a good idea during the next few days to remain active (light exercise like walking, swimming or a quick bike ride will help flush the toxins out of your body and keep you from stiffening up). To further help that process, you can engage in self-massage or treat yourself to a professional one. After the initial recovery period is over, you’ll still want to avoid running for at least a week (although two would be better). Remember, your body has been through an incredible ordeal; it needs plenty of time to recover, and you would be wise to give yourself that time. Of course all of the above only applies if you’ve completed your race injury free. If you sustained a foot, toe or ankle injury while training for or running a marathon, schedule an appointment with your Houston podiatrist immediately so you can begin your recovery and avoid future complications.